Our Customer Service staff serves our website and catalog customers. We're here to answer questions or help with orders via email, phone (888-401-1900), or fax (800-526-7329). Note: Customer Service is closed on Thanksgiving and Christmas. As a manufacturer and retailer who sells direct, Rejuvenation strives for fair pricing in order to stay competitive and affordable for all customers. Note: Architects, contractors, designers, and other members of the Trades, please email Customer Service or call 844-800-0818. Our light fixtures are UL listed and will provide many years of safe operation if used with the proper type of bulb that is within the maximum allowable wattage. We do not guarantee against damage caused by improper light bulbs. "Bad" light bulbs to avoid using in our fixtures include regular (Type A) bulbs in higher wattages or smaller sizes than we state as allowable, and "decorator" or "flame" bulbs, which are intended to be used in a "pointed up" position (bulb base down) and sometimes burn inefficiently, i.e., very hot. Rejuvenation Inc.'s limited warranty covers defects in materials and workmanship in selected products that are sold to Rejuvenation Inc. customers. This warranty lasts for a period of two (2) years after the receipt of products from Rejuvenation Inc.
Rejuvenation Inc. will repair or replace, at its option, the defective products. Vintage or salvage goods, which are sold as is. Consumable goods, such as (but not limited to) light bulbs, candles, paint strippers, finish restorers and the like. Damage to light fixtures or shades caused by the improper use of light bulbs (details above). Changes in the look of unlacquered brass and oil-rubbed bronze finishes. Damage to finishes caused by improper cleaning, maintenance, or exposure to weather or other corrosive elements. Fading, pilling and shrinkage of fabric, or damage to fabrics caused by after-market stain repellants and cleaning products. Natural variations in texture and color of upholstery. Normal wear and tear, as well as weather-related damage. Incidental or consequential damages. Some states do not allow the exclusion or limitation of incidental or consequential damages, so this limitation may not apply to you. Cost of removal and re-installation. In person: at our retail stores. We will discuss the nature of the problem with you and determine the best course of action. If we ask you to return the product to us for inspection, we will contact you within ten (10) working days of receiving the product with an evaluation of your claim, and intended remedies. If a Rejuvenation Inc. vendor provides warranty coverage beyond the above, Rejuvenation Inc. will facilitate warranty service under the vendor's terms and conditions. Most of our customizable products are built-to-order at our Portland, Oregon factory and will be delivered to your door in 2-5 weeks. Our hardware, décor, and a few of our popular light fixtures are stocked and can ship in 3-4 days. A few of our products ship directly from the supplier and can be subject to different lead times. These will be called out in the product's description if applicable. Your purchases ship as they are available, and may arrive in multiple boxes on different days. If anything affects lead times after you've placed your order, we will notify you. For more information see shipping & delivery. Please see our full policy on returns & exchanges. We don't charge your card until your order is packed and ready to ship. We start building your fixtures to your specifications as soon as we receive your order. If everything you've ordered is on the shelf, we process your credit card and ship the order same day, on average. If anything prevents us from starting on your order immediately, we'll contact you prior to processing your card. Please allow an additional two to ten days for shipping time, depending on your distance from our factory here in Oregon. State laws require us to charge AR, CA, CO, CT, DC, FL, GA, HI, IA, ID, IL, IN, KY, MA, MD, ME, MI, MN, MO, MS, NC, ND, NJ, NM, NV, NY, OH, OK, PA, RI, SC, SD, TN, TX, UT, VA, VT, WA, WI, WV, WY State residents sales tax on each order total (products + shipping and processing charges). Currently, we do not charge sales tax for orders shipped to any other states. What are the Terms and Conditions for Rejuvenation's Promotions? All promotional pricing is as marked on the website unless promotion requires use of a promotion code; if a promo code is required as part of a promotion, promotional pricing will be reflected during checkout once an eligible promo code is entered and accepted. Offers cannot be applied to prior purchases and cannot be combined. If your purchase is eligible for multiple offers, you will receive the greater discount of the multiple offers but offers will not be combined or stacked. Some of our promotion terms and conditions vary by promotion type, as summarized (but not limited to) the types below. Category percent off promotions (e.g. 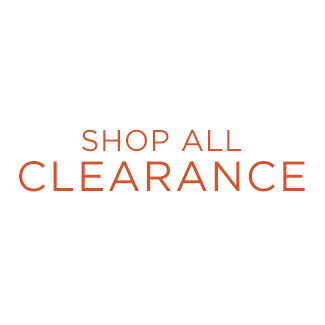 X% off lighting, X% off clearance, etc.) apply only to select products as designated on the website. Offers cannot be applied to prior purchases. No promotion code is required on category percent off promotions; pricing is as indicated on the website. Offer may not be combined with any other coupons, discounts or offers. Sitewide percent off promotions apply only to eligible products. Offer cannot be applied to prior purchases. Designated promotion code must be entered at checkout to receive the designated discount on your order. Promotion code may not be combined with any other coupons, discounts or offers. Free shipping and processing promotions apply to eligible products. Offer not valid on Select Furniture, Bathtubs, Sinks, Large Rugs, and Select Salvage. Offer cannot be applied to prior purchases. Rush shipping is not eligible. Designated promotion code must be entered at checkout to receive free shipping on your order. Promotion code may not be combined with any other coupons, discounts or offers. If you have questions about a specific promotion's Terms and Conditions, please call customer service at 888-401-1900 or email customerservice@rejuvenation.com. We offer 15% off to all active duty and retired military personnel and their families. Customers must show a valid military ID or family ID card to receive the discount. Discount is valid on purchases made in-store and via our call center only. Discount is not valid on prior purchases, gift cards, taxes or shipping and processing fees. I am tax exempt - why am I seeing tax applied to my order? Our site does not manage your exempt status. If you are filed as exempt, the tax will drop off upon reaching your account. Lighting: You can purchase our lighting "as shown" or, in most cases, customize it to match your specific needs. As Shown: If you want your fixture exactly as it's shown in the photograph, simply fill in the the quantity you want and click "Add to Cart". Make Changes: To customize your fixture, click on any of the choices under "Product Configuration Options" in the middle of the page. You'll be offered choices for finish, shades, overall length, or other options. Once you've decide how you want it built, choose the quantity and click "Add to Cart". Hardware: Choose from metal finishes that complement our lighting. Some hardware, like our Interior and Exterior Door Sets, have even more options to choose from. Special Care Orders: Expedited shipping, shipments to Canada, and special customization features (i.e. non-standard metal finishes, alternate canopies) can be ordered offline through Customer Service. Email or call 888-401-1900. Finally, the FAQ contains a wealth of ordering and product info. If you don't find what you need there, Customer Service can help. Is this light too big, too small, or just right? Tip: With large, wide fixtures, like the Nob Hill, South Shore, and others, we recommend you give careful attention to lighting specifications when gauging scale and impact. Simply put, big fixtures like these look and fit best in large, open rooms. Are Lighting Installation Instructions Online? Yes. Installation instructions for each wall and ceiling light are online for you to print at home, if needed. Instructions for each fixture also come packaged with your order. Look for the "Installation Instructions" link on each fixture's individual page. Are These Real Reproductions of Antique Lighting? We manufacture a wide variety of period-authentic, reproduction lighting styles, and many well-researched historic reproductions. Lighting identified with the Rejuvenation shopmark we build and finish in our Portland, Oregon factory. These fixtures are exclusively ours. There are many types of antique lighting "originals." Some were handmade works of art - elegant both in design and construction - and found only in the finest homes and mansions. The majority of antique lighting, however, was built for the middle and working classes. Traditional Construction. We build our lighting just the way original antique lighting was built - by hand. Materials. We build them from the same materials as the originals. Most of our lighting is brass, some are porcelain and some are part aluminum (see our Streamline, Atomic Age, and Art Deco styles). Some materials are even better than the originals: Our brass pipe and tubing is actually thicker and heavier than that found in most antique lighting. No Easy Shortcuts. Original gas lights, for example, couldn't hang on chain (gas can't travel through a chain). So we make them with pipes and work with you to get the length just right for your ceiling. Original Moulds and Tooling. We often recreate antique lighting parts and glassware with the original, vintage tooling - which helps us produce a superior reproduction of antique lighting originals. A majority of the glass shades we offer are made from original glass moulds we either own or have duplicated from the originals. Document Lighting. Many of our lights are "documents" of antique lighting models. That means we've taken an original and exactly duplicated every part. Others are typical of a certain type, but are not "document." For example, the Wilshire is document, but the Jackson Park is not. How do Rejuvenation fixtures differ from the originals? Metal thickness. Despite common preconceptions, the majority of late-19th-century and 20th-century lighting was made with brass spinnings and stampings that were very thin. Ours are usually thicker than their original counterparts. Modern wiring. Some changes from originals are necessary to accommodate modern wiring. Most of our customers are mounting to newer wiring instead of knob and tube. We have to make a few changes, such as larger canopies on some of our wall brackets, so junction boxes will be covered. Underwriter Laboratories safety labels. All our fixtures are individually subjected to high-voltage testing. Most required modifications you won't see; a few you will. Current regulations require that fixtures have a continuous ground. Therefore, you'll see ground wires on chain fixtures. To supply UL-listed floor and table lamps, we can't use the old cloth-covered wire, which is not UL-approved. Sturdier sockets. We like to use porcelain sockets in places where the originals might have had a paper-shell socket. Exceptions to this are on fixtures which have turnkey sockets. Electric, not gas. Obviously, our fully electrified gas-style fixtures have had small modifications to make them work with electricity. We try to make those modifications in the most subtle ways possible. Spot welding. Most old lanterns were fabricated by soldering pieces of sheet brass together. Often the solder eventually failed. We spot weld (a better method), since we have the advantage of 90 years' worth of hindsight. Do you sell lamp parts? We are not in the business of selling lamp parts, and we don't publish a lamp-parts catalog. What if I don't have a wall switch? Switch options for most fixtures are available online during ordering. Just select an optional brass rotary or pull-chain switch, and we'll set it into the fixture's canopy (see drawings). Some fixtures have a turnkey switch on the socket, just like the old ones. Tip: Wall fixtures can use either kind of switch, but we suggest pull-chain switches for ceiling fixtures. Questions? Email or call Customer Service toll-free at 888-401-1900. How can I obtain enough light from my ceiling fixture? Customers of old-time lighting companies could specify how many arms they wanted on their ceiling fixtures, and at Rejuvenation, so can you. Arm choices are available on some of our chandeliers, which means that you can use a 2-arm chandelier in a small kitchen, and a 4-arm version of that same fixture in a large dining room. Customize your lighting according to your needs and tastes. Why are socket switches found on some fixtures and not on others? In an effort to be as authentic as possible, many of our Mission fixtures with square 2-1/4in. shade-holders are supplied with old-fashioned sockets and phenolic turnkey switches. Most others are supplied with keyless (no switch) porcelain sockets. If you prefer the more durable porcelain sockets, you may select them at no charge. There are a few exceptions. The "exposed" turnkey sockets found in some Victorian fixtures, and a few Period Basics (e.g. the Burnside) won't accommodate a porcelain socket without significantly altering the fixture's appearance. Therefore, alterations to exposed sockets must be done via Customer Service. What's the difference between a porcelain socket and a turnkey switch socket? A porcelain socket tends to be more durable. However, it doesn't have a built-in switch, and doesn't automatically increase the wattage capabilities of the fixture. A turnkey socket is an old-fashioned brass-and-paper socket. It combines an authentic vintage feel with the practicality of a switch. Yes, they are UL approved and perfectly safe (provided the wattage is not exceeded, and specialty bulbs are properly installed). At the turn of the 19th century, these sockets were "exposed" and often used a clamp-on fitter to hold a shade (e.g. Forest Grove). A few years later, the sockets were covered by square- or bell-shaped fitters - which could accommodate the switch and hold the shade (e.g. Pacific City). Rejuvenation, Rejuve, Burnside, Cottage Grove, East Bank, Jefferson, Lombard, Madison Avenue, Moreland, Pacific City, Park Avenue, Rose City, Salem, Sherwood, St. Helens, and Three Forks are considered trademarks of Rejuvenation. "House Parts" is our name for hardware and other old-house-inspired stuff - all built with the same quality as our lighting fixtures. Our goal is to fill a niche for tasteful, functional, and authentic hardware and other old-house accessories - and to do so with affordable prices. Considering the period-style merchandise generally available, we feel like we're staking out new territory. On one end of the spectrum, there's imported and cheaply made brass hardware. Quality is typically poor (uneven at best), functionality and durability are afterthoughts, good taste is absent, and the finish is almost always only polished brass with a lacquer over it. The price - maybe - is good. On the other end, many businesses have sprung up that do beautiful work reproducing old-house specialties. But as artisans who essentially create their good work by hand, they offer products that often cost more than most folks can afford. We think we've found the middle ground. Does Rejuvenation Sell Ceiling Fans? Yes! 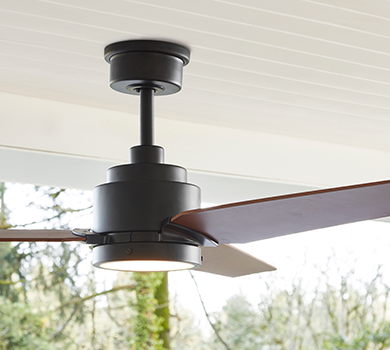 We are proud to offer three families of ceiling fans, the Heron, Falcon, and Peregrine, available in several combinations of finishes and lighting options. Why should I choose schoolhouse-style lighting? One of the great qualities of old houses is how richly eclectic they can be. 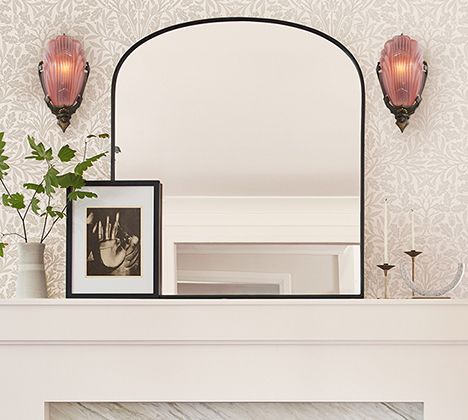 Whether furnished in bohemian or period-specific style, old house interiors gracefully welcome all interests. Schoolhouse lighting is a lot like that, too. 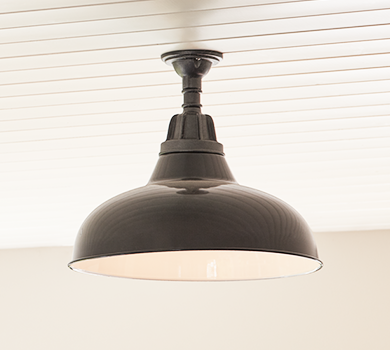 In fact, without shades, a schoolhouse fixture is like a blank canvas, awaiting your paintbrush. However you express yourself, you'll find combinations that please the eye and complement your decor. Get creative, and build your schoolhouse lighting online. Why a "shades-up" lighting option? Shades-down and shades-up options date back to early gas lighting. Early American gas-style fixtures provided light via flames, and were built shades-up only (for obvious safety reasons). When electric lighting came along, the light bulbs of the time were comparatively dim. Manufacturers compensated by building fixtures shades-down, so their customers would have their precious (and weak) sources of light pointing where they'd be the most effective. Around 1910, advances in carbon filament technology had made light bulbs brighter and more efficient, and lighting companies responded by making up-cast shades again - not only because they could, but because it was by now a familiar look that hearkened back to the days of early gas lighting. What is a "deep projection" wall bracket, and why would I need one? Wall brackets installed above or beside surface mount medicine cabinets may require extra room. Can I use your lights on sloped/vaulted ceilings? For an additional charge, many of our single-pole pendant fixtures can be built to accommodate sloped ceilings. Fixtures which hang from a single chain or cord, like our chain pendants and cord pendants, automatically adjust to sloped ceilings, so no vault mount is needed. However, be sure to tell us that you're installing a chain fixture on a sloped ceiling, so that we can adjust the fixture length accordingly. Tip: When ordering vaulted ceiling fixtures at a specific overall length, expect up to a 1in. variance in overall length due to the varying pitches of sloped ceilings. Can I shorten or lengthen your lighting myself? A number of our fixtures can be shortened prior to installation, with varying degrees of difficulty. However, you should know that mechanically altering a light will void its warranty. If you are still willing to assume the risk, we've separated these alterations into two categories, below. Please proceed with caution. Rejuvenation is not responsible for fixture damages in any way. Chain Link Lighting: e.g., fixtures like our chain pendants. Remove the unwanted chain links with a chain spreader, pull the extra wire through the ceiling canopy, and trim the wire. Single-Pole Pendant Lighting: e.g., fixtures like our rod pendants, which hang from one rigid length of tubing. Remove the ceiling canopy, disassemble as needed to pull the wire out from the allthread, and use a hacksaw to cut both the tubing and allthread pipe inside. Do not cut the allthread pipe with the wire still inside. Pendant Lighting with Loop-to-Loop connections: e.g., fixtures like the Brightwood. Tricky for DIY alterations. Ask a local lamp repair shop (and make sure they guarantee their work). Multiple-pole Lighting: e.g., fixtures like the Willamette. Quite difficult to alter. Ask a local lamp repair shop (and make sure they guarantee their work). Lengthening fixtures and matching to their original finishes is very difficult to do. It's best to order the length you need, or failing that, ordering some additional length and shorten as needed (see above). The current standard installation prep - a 2-1/8in. hole drilled through face of door to receive a modern-style "cylinder latch" mechanism. Measurement from edge of door to center of doorknob (and spindle hub where spindle passes through latch). A hinge with ball-shaped tips at top and bottom of knuckle; standard for most pre-1940 hinges. A mechanism that locks a door shut only. The historical term for the many various decorative and functional pieces of hardware that are used in outfitting a home. Hinge in which both leaves are mortised (cut) into the edge of door and frame. Allows a casement window to be opened and set in a fixed position (so wind, etc., doesn't blow it closed). Our adjuster is for out-swinging windows only. Mortise Strike fastener strike for out-swinging single-casement window; install with tapered hole pointing down and tapered side towards sash. Extended Mortise Strike fastener strike for out-swinging single casement window with gap along sash edge due to insulating bead; install with tapered hole pointing down and tapered side towards sash, extending out over gap. Rim Strike fastener strike for in-swinging single-casement window; install with "hook" extending out and pointing up. Surface Strike fastener strike for in- or out-swinging pairs of casement windows; install on surface of passive (fixed) sash. Passive side usually fixed with a surface bolt at top and/or bottom. A window in which the sash (frame that holds the glass) is hinged on one side to swing open. Measuring convention that means "from the center location of one hole to the center location of a second hole." Hardware that is made with heavy-duty materials and details to withstand prolonged and extensive use. A set of two knobs (w/spindle) and two escutcheons for decorative door trim. Latch purchased separately. A window with two sashes (frames that hold glass) that slide up and down next to each other. A short-threaded square steel rod attached to a metal base that allows knob to be mounted to door with no internal latch mechanism. Used with pairsof cabinet doors to hold the passive (fixed) side closed while the active side is in use; mounted on the inside surface of passive door. Fancy name for a backplate. A hinge in which the knuckle pin cannot be removed and the two hinge leaves cannot be separated. Hinge in which pin has no tip and is suspended in hinge knuckle between two threaded tips; must be unscrewed to remove the pin. A ventilation plate that allows airflow but cannot be opened and closed. A hinge with one leaf that mounts on the surface of door, and one leaf that is mortised (cut) into the edge of the door frame. Commonly used where full surface hinges won't fit side-by-side on a narrow frame, or to lessen the amount of hardware showing. Hole in door/plate that allows a key or other device access to the inner locking mechanism. A separate plate used beneath with a rosette for covering the keyhole bore - works with different knob-keyhole spacings. A mechanism that holds a door shut; does not lock. Our reproductions of the distinctive San-O-La line of bathware, originally manufactured by the Art Brass Co. of New York during the early 20th century. A hinge in which the pin in hinge knuckle is attached to one tip and can be easily removed. The device mounted to a grille that allows airflow to be controlled. Hardware that is usually all bronze or brass, to withstand oxidation. Known by many names, this generic term can signify any fastener that works by spreading some device on the backside of a wall/panel/ceiling surface to create a hold. Term used when a rectangular hole or area needs to be cut out of wood to receive a piece of hardware, etc. A locking latch mechanism that requires a rectangular hole in door edge for installation. Ubiquitous in pre-1940 homes, this type of lock is known by many other names. A latch mechanism with a rectangular body that requires a rectangular hole in door edge for installation. A hinge that is offset to allow for a door that overlaps its frame. Term used for the horizontal pieces that constitute the top and bottom edges of a door. A ventilation grille that can be opened and closed. An old-style "box" lock that was made to mount on the surface of a door instead of being mortised into the edge of the door. Knobs for rim locks typically have one knob with a flared seat on the bottom of the shank (for the lock side). The original trade name under which our Linfield reproductions were made and marketed by the Art Brass Co. of New York in the early 20th century (nearly always marked/signed). The "frame" that holds the glass pane(s) in a window. A small screw in the shank of a knob that is tightened to fix the knob on the spindle. Old set-screws varied widely in diameter and thread count. The cylindrical base of a doorknob, which seats in the collar or ferrule on the escutcheon/rosette. A square steel rod connecting two doorknobs through the latch. The spindle can be threaded or have holes in its side, depending on what type of knob it's used with. Old spindles (and our spindles) are usually 9/32in. (7mm). New spindles are often 8mm (slightly larger). Threaded spindles can be 16tpi (threads per inch), 18tpi or 20tpi. Most new spindles, including ours, are 20tpi. The device in a lock or latch through which the knob spindle passes to operate the mechanism. The spindle hole in a hub can be oriented "on the square" or "on the diamond" (or "star-broached" if it allows the use of both orientations). Old hubs are typically "on the diamond" (except for Yale locks), while new hubs are typically "on the square." Orientation will impact proper installation angle for knobs that are directional (oval, etc.). Hole size can be 9/32in. (7mm) or 8mm, so proper verification of compatibility is required when using our knobs with other locks or latches. Term for the vertical pieces that constitute the side edges of a door. For pairs of doors or windows - a device mounted on the surface of the passive (fixed) side of pair to allow it to remain shut tight while active side is in use. A hinge that mounts on the face of both door and doorframe. A latch mechanism with tubular body intended to be inserted into a drilled hole in door edge for installation. Hand-rolled, translucent layers of molten colored glass. Art glass shades cast an incomparable warm and intimate glow, as seen in lantern-style lighting and on handmade Tiffany-style shades. Pool-table lights. These also work nicely over kitchen islands or counters. These fixtures have three or four chains or rods that extend from the canopy and attach to a bowl shade, usually with gravity hooks. The part of a fixture that actually mounts to the ceiling or wall and covers the junction box to which the fixture attaches. Shade finish that gets its name from fused layers of different glass. Usually, colored glass is outside and white glass is inside, to help cast bright light downward. Commonly used on cone shades. (aka frosted glass) Shade finish with a "foggy" sort of appearance that reduces glare and softens light. The "lip" part of a glass shade or globe that attaches to the shade-holder part of the fixture. Common fitter sizes (diameters) are 2-1/4in., 3-1/4in., 4in. and 6in.. Typically, the fitter measures slightly less than these dimensions. Fixtures for ceilings that are eight feet or lower. Typically a single pole or chain extending from the ceiling canopy - usually with one light. Shade finish that is etched to further soften and diffuse an opal shade's light. In general terms, this includes any wall fixture - although the purist definition would define only a candle- or torch-style wall bracket. The part or parts of a fixture into which the "fitter" of the glass shades or globes fit. Most shade-holders have three or four screws that hold the shade in place. Common shade-holder sizes are the same as "fitter" sizes, although they often measure slightly larger than the dimensions listed. Translucent, glossy milk-white glass that produces an evenly diffused glow, which also helps mask the bulb inside the shade. Very popular, and common to painted shades and schoolhouse-style shades. 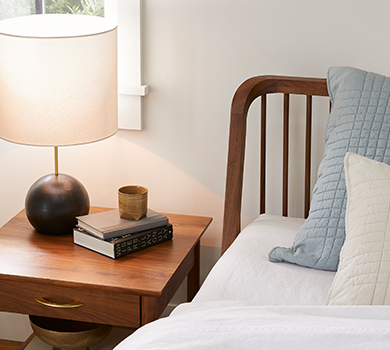 Shade finish that adds rich and subtle color to the light from frosted shades. Wall brackets / sconces suitable for the bathroom. Do you offer a variety of art glass options for fixtures from your Arts & Crafts collection? Yes, see examples of our Art Glass Choices. Tip: When ordering vaulted ceiling fixtures at a specific overall length, expect up to a 1" variance in overall length due to the varying pitches of sloped ceilings. Can I order lighting shorter than minimum length? Sorry, but no. Our lighting minimum lengths are based on engineering, manufacturing, and safety realities. A fixture's minimum length is the shortest overall length that we can build. Can you build lights for really high ceilings? Yes! Whether for a two-story foyer in a large home or a sprawling, multi-story hotel interior, we'll build your ceiling fixture to the length you specify. To determine your fixture's length, measure from the ceiling down to the lowest point you want your fixture to hang, shade(s) included. For high ceilings that require lighting lengths 80-90in. or longer, we add a joint to fixtures that use round or square tubing. Tubing joints help long lights hang straight, and they reduce the risk of shipping damage. Around here, there's no such thing as an all-purpose "standard" fixture length. Read on to see why this is a good thing. Antique lighting lengths varied tremendously, and we choose to honor tradition and customer choice with custom reproduction lighting that is built to order. Simply put, this means that you tailor your fixtures to suit your needs. The overall length you choose depends on how and where you plan to use the light, as well as on your own comfort with it. See How do I decide on an overall length? for help. How do I decide on an overall length? In general, consider a span of 80in. to 90in. from the floor to the bottom of the light. Adjust the span based on ceiling height and room conditions, e.g., if the light illuminates a table or other furniture setting, or if you'll walk underneath it. Lower fixtures create more intimacy, higher fixtures are less noticeable, and taller ceilings may require more height from the floor. A quick cardboard and string mock-up can help you determine a comfortable length. Enter lighting length measurements in decimal whole or half inches. For example, you'd enter 36-1/2 as 36.5 online. Dining room lighting: Dining room tables are typically 31in. high. In most cases, dining room lighting should hang 30in. to 35in. above the table, or 66in. to 76in. from the floor. If you're really unsure, err towards a longer length which can be shortened on site if absolutely necessary. Kitchen island and counter lighting: Work spaces need focused task lighting. Hanging pendant lights 72in. to 76in. from the floor provides illumination and head room, although tall folks may want even shorter (higher) fixtures. Unless your kitchen is small, island and counter task lighting shouldn't be your primary light source. High-wattage ceiling fixtures work with wall and pendant lighting to provide complete kitchen illumination. Pool/Billiards table lighting: Regulation pool tables are built to a height of 29 1/4in. to 31in.. Billiard lighting traditionally hangs between 60in. and 62in. from the floor. (Some sources quote a strict 31in. above the table.) Use floor, wall, or smaller ceiling fixtures provide the remaining light needed to navigate the game room. What is a GU24 base? In energy-efficient lighting fixtures, the GU24 socket and base system replaces the common Edison socket and screw-in bulb base. GU24 bulbs have 2 pins which connect to the base with a twist-and-lock connection. Screw-in CFLs and incandescent bulbs cannot be used in GU24 fixtures. CFLs with a GU24 base connect directly to the power line, and they are functionally equivalent to screw-in CFLs. Is all Rejuvenation lighting available with the GU24 option? Most of our reproductions will accommodate GU24 technology without much fuss, and we'll gradually be adding this option to fixtures online. If you'd like the GU24 option on a fixture not yet offered online, we can probably build it for you. Email or call Customer Service at 888-401-1900. How does GU24 compact fluorescent lighting save money and energy? save enough energy to light more than 3 million homes for a year. save more than $600 million in annual energy costs. save about $30 or more in electricity costs over the life of each compact fluorescent bulb. produce about 75% less heat, which helps cuts energy costs associated with home cooling. Do compact fluorescent bulbs contain mercury? CFLs, including GU24 bulbs, contain a minuscule amount of mercury - about 5 milligrams. Mercury helps make compact fluorescent bulbs energy efficient. However, compare the power plant emissions over the lifetime of an incandescent bulb to a CFL. Using an incandescent bulb will release an average of 13 mg of mercury into the environment. CFLs will contribute a paltry 3.5mg over their much longer lifetimes. Any compact fluorescent bulb should still be recycled or disposed of according to local guidelines. Contact your local municipal solid waste agency or visit lamprecycle.org. Tip: Our local store customers can bring their used CFLs in to any of our store locations. We'll get them to a recycler. They can be - if you use a dimmable GU24 LED or CFL in your fixture. Not all LEDs and CFLs are able to dim. Check the product specifications to ensure your bulb is able to dim, and verify that the dimmer you use is compatible with your bulb. Do you offer light fixtures in a variety of finishes? Yes, read about our lighting finishes or order a set of finish tiles. Our fixtures conform to UL standards, are tested as a complete unit, and bear the UL label. A few offer period-authentic options like twisted lamp cord, and so are not UL-approved (which is noted on the products themselves). Do I need to use UL damp location lights in a bathroom? No - but local codes do vary (and change), so check with your electrician. Tip: None of our lights are designed, recommended, or safe for installation directly inside showers. What is the difference between UL damp and wet locations? 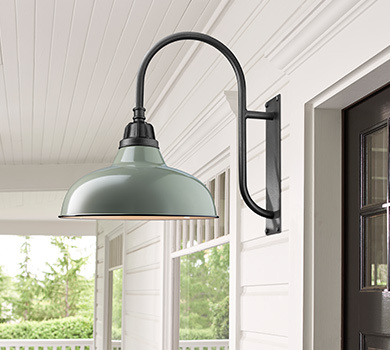 Engineering specifications aside, UL damp-location lighting is designed to operate safely in outdoor locations that are protected from the direct elements, such as a porch. Damp-location lighting is not designed to withstand constant or significant moisture. UL wet-location lighting can be used almost anywhere - on unprotected exterior walls, along a garden path, atop columns or fence posts. Wet-location lights are designed to be reasonably watertight; they require a seal around the base, canopy, or bracket to protect the electrical service from moisture. What are the brass bathroom hardware finish choices? Which bath hardware options affect the cost? As with our Lighting and Interior and Exterior Door Hardware, different options can change the price of the item. Costs of Towel Bars and Bath Shelves increase with width, if width choices are available. Also, tempered glass towel rods cost a little more than nickel-plated brass rods. Tip: For towel bars with a glass or brass towel rod choice, tempered glass has an uncommon look which blends particularly well with period and contemporary bathrooms. Forced into moulds under heavy pressure, rammed porcelain results in a dense, solid porcelain that is stronger, heftier, and more durable than common slip-cast porcelain pieces, which are often hollow and lightweight. I have some old porcelain towel bar ends that are missing their bracket clips - will your clips fit my bath hardware? While our clips are exact reproductions, there were as many different clips in the old days as there were manufacturers of porcelain bathware. More than likely, our clips won't fit your old towel bars. Some antique porcelain bath accessories won't hold today's large soap, toothbrushes, and toilet paper - will yours? We have tweaked the dimensions of our soap dish, toothbrush holder, and toilet paper holder to be compatible with the most common products today - however, this is no guarantee that your favorite brand will be a perfect match. What's included in your Cabinet Hardware line, and what makes yours different? We offer a broad selection of cabinet hardware designs from the late 1800s to the 1950s. Within our collections of Drawer Pulls, Knobs, Bin Pulls, Furniture Hardware, Latches, and Hinges, you'll find hardware suitable for Victorian to Mid-Century cabinet and furniture styles. Much of the cabinet hardware we offer is exclusive to us, a good selection of period-authentic replicas with traditional details like slotted oval- or flat-head mounting screws, loose pins in hinges, and sturdy brass castings. All are carefully recreated from original antiques. 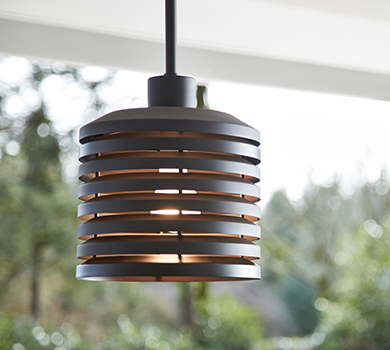 Rejuvenation exclusives are available in various finishes designed to complement our lighting. We also carry select cabinet hardware from other manufacturers. 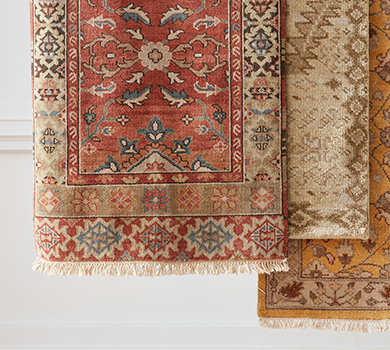 Some are authentic period designs, others are looser interpretations of period styles, but they all are among the most popular designs we've sold for years in our Portland store. Finishes vary from product to product; many will also coordinate well with our lighting. Are the Cabinet Hardware hinges sold per pair? Our exclusive cabinet hinges are offered in six finishes, and sold and priced per pair. We also carry a selection of other hinges, some packaged in pairs, others sold individually. I'm looking for offset cabinet hinges; any suggestions? Offset hinges were first seen regularly on the Hoosier cabinets and really came on strong in the 1920s - there were and are so many variations it's hard to know where to start. We currently offer one style, and you may also want to keep an eye on our restored antique hinges as well, if you're after something unique. Which Cover plate do I use with a round-knob dimmer switch? Round knob dimmer switches should be installed with standard toggle plates. The rectangular opening in the plate will be hidden behind the knob of your dimmer. What types of switches and plates would have been original in my old house? Along with the development of knob and tube wiring came an explosion of specialty wall-mounted switches, receptacles, and indicator devices as companies fought to establish dominance in the new arena of electrical convenience. The majority of these innovative experiments are now obsolete. Nearly all these devices, however, were accompanied by the same solid-brass beveled Cover plates that we reproduce. If you stick with push-button switches and duplex outlets, you really can't go wrong. And don't forget to consider the color of the devices that your plates will mount over. Most early switches and receptacles were black or brown. The white and ivory ones common today were a later development. What were the typical metal finishes on Cover plates earlier this century? The most common period finishes on Cover plates were Polished Brass, Brushed Brass, Dull Brass, and Polished Nickel. Polished Brass could have been lacquered or unlacquered, and Dull Brass was often just a metallic paint (which saved the manufacturer the cost of polishing). What can I do to help the finishes on my Cover plates age gracefully? No protective finish will last forever. However, to help ease your plates through time, give them an occasional waxing with a Johnson's-type paste wax or a neutral shoe polish. How Do I Choose The Right Pocket Door Set? Double Privacy Sets are used for pairs of pocket doors that meet in the middle of the door frame, and need to lock together. These sets have a thumbturn inside and a keyhole outside for access. Single Keyhole Passage Sets are non-locking sets for single pocket doors. The keyhole on the outside plate provides the look of an old pocket door set, and isn't functional. Single Plain Passage Sets are identical to the above set, but without the "just for looks" keyhole. Single Privacy Sets are for lockable single pocket doors. These sets have a thumbturn inside and a keyhole outside for access, and come with a strike. Will Your Door Hardware Fit My Home's New Doors? Although our Interior Door Sets are designed to cover the 2 1/8in. bore commonly pre-bored into newer doors, there may be other factors which require further discussion. We also recommend that your carpenter has our Exterior Door Sets in-hand before preparing the door for fitting. If you have questions or doubts, please tell us more about your situation before ordering. Email Customer Service or call 888-401-1900. Will Your New Door Hardware Replace My Old Door Hardware? For interior doors, our doorknobs and backplates are compatible with most old mortise locks. Exterior doors, however, will likely require retrofitting by an experienced carpenter. Generally, replacement door hardware won't necessarily fit or cover all the holes drilled for the previous door hardware - there wasn't and isn't any one universally employed configuration, especially on old doors. We suggest hanging onto your old mortise locks, tube latches, and strike plates until you've got our new stuff in hand. Keyhole-to-knob spacing is 2-1/4in., center-to-center; 9/32in. spindle set "on the diamond" for correct knob orientation (especially helpful for oval knobs). The spindles are a standard 5/16in. thick. Longer spindles will probably be required for doors over 1-3/8in. thick. Contact Customer Service for longer spindles. I Have Thicker-Than-Average Doors; Will Your Interior Door Sets Fit? If your doors are thicker than 1-3/8in., you probably need a spindle 1/4in. or 1/2in. longer than the 3-1/2in. inch spindle supplied with our Interior Door Sets. Please email or call Customer Service at 888-401-1900 for assistance. What Interior Door Set Should I Use? Your Designs Don't Look Familiar. 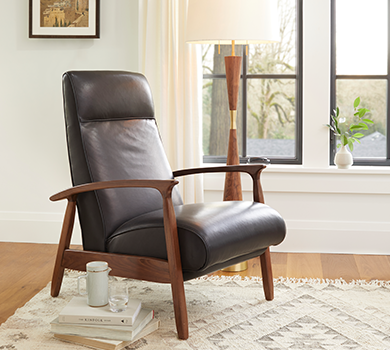 The Wentworth (originally called Cleo when first manufactured by Russell and Erwin) is simple and elegant - with a universal appeal - and will complement most interiors and other hardware without clashing. If you want door hardware with even less detail, the Benson, Putman, and Adams are good choices. Can I Use Your Interior Door Sets on Screen Doors? It's easier to use one of our Screen Door Hardware Sets, but, yes, some wood frame screen doors will take our Interior Door Sets, provided the door is thick and strong enough to accept the larger latches, and that you're comfortable with retrofitting. This may be a job for your contractor if you haven't installed door hardware before, or if you're replacing existing screen door hardware with ours. First, make sure the screen door casing is wide enough to accommodate the backplate of the Interior Door Set you want. Once you've got your door set in hand, you'll need to cut the spindle, as screen doors are considerably thinner than most interior doors. Make sure you don't damage the spindle threads; doorknobs screw down onto threads for secure fastening. And finally, you'll likely need to purchase a separate screen door latch which is much smaller than an interior door tube latch. Also, know that screen door latches for wood doors typically don't come in a wide variety of finishes. Currently, we don't sell screen door latches online, but many hardware shops carry them or can order them for you. My old door hinges are missing ball tips. Can I buy replacement ball tips from you? Regrettably, the ball tips on our Door Hinges won't fit other door hinges. We don't sell ball tips separately. The ball tips thread on the bottom of the door hinge, and are permanently fixed with Loctite brand adhesive. On the top of the door hinge, they are fixed on the pin. A Bore Insert is needed to fill the wide 2-1/8in. hole in most pre-drilled new wood doors, and some old wood doors that have been retrofitted for new hardware. Wood doors with a 2-1/8in. diameter hole drilled through them require an optional Bore Insert for our "Rosette" Interior Door Sets (that is, those with smaller round backplates). Replacing door hardware on existing interior wood doors? Before ordering, remove door hardware and measure the diameter of the holes bored through each door. A hole 2in. or smaller does not require an optional Bore Insert. Ordering door hardware for new interior wood doors? Most doors bought "off the rack" or custom ordered are usually pre-drilled with a 2-1/8in. bore, and will require an optional Bore Insert. Installing a door set involves drilling holes in your door - holes that will vary depending on the type of door set you have. Most door sets in pre-1930s houses were of the mortise lock type. These distinctive box-like locks were installed in a large hole, or mortise, in the edge of the door. Mortise locks allowed for locking with a key or thumbturn, and utilized independent plates and knobs connected through the door with a steel spindle. Today, most door hardware uses a cylinder latch designed to mount in a 2-1/8in. hole, or bore. Cylinder latches are built as a whole with their plates and knobs, and cannot be intermixed with older knob-and-spindle type door sets. The cylinder latch was introduced in 1924 by Schlage, and by the late-1940s had pretty much displaced traditional mortise locks as the standard for door hardware. Because they remain the industry standard to this day, many new doors come pre-bored to accept cylinder latches. Our door sets have a foot in the past and a foot in the present. Our door trim is of the knob-and-spindle type just like old hardware, and will work with new or existing mortise locks, as well as easy-to-install tube latches. Tube latches mount in a simple hole drilled into the edge of the door. Our sets are also designed to hide or accommodate a standard 2-1/8" bore, although it is preferable to install them on unbored doors. And for you true old-house enthusiasts, we offer a unique and proprietary privacy system. This system uses dual tube latches with a single joining faceplate. 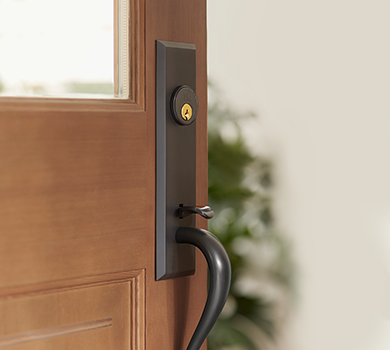 When installed, our privacy system looks and operates just like the old thumbturn-type mortise locks used to. What are Door Hardware Passage Sets? A passage door set is interior door hardware with a latch, and no lock. While ordering Interior Door Sets, select an optional Tube Latch for a passage function. As used in our Privacy Set, Privacy Bolts are locks which are activated by a thumb-turn. Privacy Bolts are typically used on the inside of bathroom doors. Select the optional privacy bolt when ordering our Interior Door Sets. What are Door Hardware Privacy Systems? Privacy Systems lock from one side using a thumb-turn, and are common features on bathroom doors. This innovative and exclusive design looks like a mortise lock when installed, and mounts in 1in. standard bores (through door's edge). Included are 1 Tube Latch (top), 1 Privacy Bolt (bottom), and 2 Door Strike Plates. Order a Privacy Set separately for your own existing hardware, or select the Privacy Set option while ordering our Interior Door Sets. For emergency access from outside the door, select a keyhole option for one backplate while ordering. What are Dummy Door Sets? When doorknobs, levers and backplates are purely decorative and don't turn or operate a latch, you have a dummy set, as is sometimes used on closet doors. If you need this option, select our Dummy Spindles when ordering Interior Door Sets. Dummy Spindles are covered by the backplate, and remain hidden once door hardware is installed. Doors with Dummy Spindles may also need a Ball Catch in order to stay closed. When you turn a doorknob or lever to open a door, you're turning a spring-tension latch. Our Tube Latches have the old-fashioned tubular body, which is installed into a hole drilled in the door's edge. They're the standard 2.375in. (2-3/8in.) backset, and can be ordered with our Interior Door Sets. Ball Catches are used for doors which are opened by pulling or pushing. When the door is closed, spring tension pushes a brass ball into a notched brass plate in the doorjamb. Ball Catches are typically used with Dummy Spindles on closet and utility doors which don't have tube latches. Backset is the measurement from the door's edge to the center of the hole bored for the doorknobs. All lock and latch options for our Interior Door Sets have a standard 2-3/8in. backset. Mortise locks for our Exterior Door Sets come in either 2-1/2in. or 2-3/4in. backsets. Tip: Before replacing an existing lock or latch with a new one, check if the backset measurements are the same. If they are different, you'll need to retrofit your door for the new hardware. This can be a difficult task, and may be best left to an experienced contractor. What are Mortise Locks and Latches? Mortise locks are locking latch mechanisms that require a rectangular hole in the door edge for installation. Mortise latches have the same shape, but only a latch function. They don't lock. In old homes, some interior doors will have only mortise latches installed. Common in pre-1940 homes, and sometimes hard to find new, this type of lock is known by many other names. We supply a full mortise lock with a locking cylinder in every Exterior Door Set. Tip: Mortise locks are durable, heavy, and, if you have old ones, worth keeping. Common problems such as weak latch tension are typically due to worn-out pins or springs. These can (and should) be replaced by an experienced locksmith who is familiar with mortise locks. Dummy Spindles are used to mount a doorknob or lever that doesn't operate a latch - a feature sometimes seen on closet doors, for example. Doors with this feature may require a Ball Catch in order to stay closed. What Should I Know about Door Hardware Codes? ADA requires levers instead of doorknobs, and some commercial doors require closers or specific kinds of door hinges, which we don't sell. Public and commercial spaces often must follow detailed requirements. It's best to check local codes or ask your contractor, but more often than not, our Door Hardware should work fine for most applications. "Builder's Hardware" is a traditional term used in old hardware catalogs which describes our various collections of hardware. Instead of looking for "Builder's Hardware" on the site, just look for the category of product you want (Door Hinges, Door Strikes/Strike Plates, Casement Window Fasteners, Sash Locks, etc. What are Door Strike Plates? Strike plates or door strikes are the protective metal plate installed in the door jamb that receives the latch or lock "tongue" when door is closed. A latch strike plate is typically T-shaped with a single hole, and a mortise lock strike, like our selection of brass Door Strikes, is typically elongated with two holes (for latch and bolt). Any Interior Door Set ordered with either passage or privacy options comes with matching strike plates. All Exterior Door Sets, regardless of options ordered, come with a matching strike plate. A spindle is the metal rod that doorknobs and levers are mounted on. Regular spindles (as opposed to dummy spindles) extend through the door and latch to the doorknob on the other side. Once backplates and doorknobs are installed, spindles are completely hidden. Antique door hardware was made with many spindle varieties: threaded, plain, and split, to name a few. Our 9/32in. square steel spindles are all threaded 20tpi (threads per inch) - the most common size, and the standard threading for most new doorknobs designed for threaded spindles. Except for the Dummy Door Set, all Interior Door Sets come with spindles. In what widths are Drapery Sets available? Please enter width in decimal form. To convert fractions to decimals, divide the numerator by the denominator. For example, use 48.125 instead of 48-1/8in. Turned Final, Mushroom Finial, Deco Final, and Ball Finial Drapery Rod Sets: Order up to 144in. wide. Up to 72in., drapery rods are one single, continuous piece. Between 72in. and 144in. requires two curtain rods joined in the middle, and includes one additional center support bracket (for a total of three brackets). Cost beyond 72in. is an additional $15/foot. The Inside-Mount, Outside-Mount, and Concealed-Mount Cafe Sets can be ordered up to 60in. wide, and have one, single rod. How do I measure for cut-to-order Drapery Rods? Turned Final, Mushroom Finial, Deco Final, and Ball Finial Drapery Rod Sets: Measured to the nearest 1/8in. of the overall width from finial tip to finial tip. Inside-Mount, and Concealed-Mount Cafe Sets: Measure to nearest 1/8in. the inside overall width across window casing. Outside-Mount Cafe Sets: Measure to nearest 1/8in. the outside overall width across window casing. What do Drapery Sets include? Inside-Mount, Outside-Mount, and Concealed-Mount Cafe Sets include 2 End Brackets, Cut-to-order Drapery/Curtain Rod, Slotted-head brass screws (finished to match). Curtain Rings with Eyelets or with Clips may be ordered with Drapery Sets or individually. What is "certified" solid wood? Wood certified by the Forest Stewardship Council is available internationally and is gaining wide recognition as architects, designers, home builders/remodelers, carpenters, and manufacturers choose to protect resources by specifying and using certified forest products. The Trademark of the Forest Stewardship Council (FSC) indicates that the wood used to make the product comes from a forest which is well managed according to strict environmental, social and economic standards. The forest of origin has been independently inspected and evaluated according to the principles and criteria for forest management agreed and approved by the Forest Stewardship Council. FSC is an international, non-profit association whose membership comprises environmental and social groups and progressive forestry and wood retail companies working in partnership to improve forest management worldwide. The wood in our Medicine Cabinets comes from these "natural working forests"; once a tree is felled, it's not replanted by man or machine. The forest floor is naturally reseeded by the trees left standing, ensuring the diversity of species and a process that's better for our water, wildlife, and us human beings. Ogee is an "S" curve profile, seen in various forms of finish carpentry. On our medicine cabinet doors, the ogee profile is cut into the inner edge of the door, where it borders the mirror. In this case, ogee detail functions as a visual transition between the mirror and the wood. What is stile and rail construction? Stile and rail more or less defines the way our medicine cabinet doors look and how they're put together. Each top and bottom board butts against the adjacent side boards to create a solid, traditional appearance. For a visual aid, if you live in an older house with solid-wood paneled interior doors, look at the corners and casing for examples of how stile and rail construction looks. It's quite sturdy. What are fully mortised ball-tip hinges? Mortised means the cabinet door and frame have been recessed where the hinges fasten; the hinges fit flush into the woodwork. When the door is shut, all that's visible of the hinge is its knuckle. Ball Tips are a detail common to older cabinet and door hinges. Ours thread into the top and bottom of the knuckle. Does Rejuvenation custom-build Medicine cabinets in other sizes? We're unable to produce custom-sized Medicine cabinets for you. We measured many old, salvaged cabinets and stuck with what we saw most often. We've partnered with a local craftsman and strive to keep prices and lead-times reasonable. You may want to contact a cabinetmaker if you're interested in variations on typical dimensions. Can I buy cabinet parts and plans from Rejuvenation, or contact the craftsman you're working with? You may purchase the hardware separately, but we can't sell the other cabinet parts or plans, or provide the cabinetmaker's name. Why are the medicine cabinets pre-primed? Our medicine cabinets are mostly poplar wood, which doesn't allow stain to penetrate. We've pre-primed them to be ready for your paint color. Generally, poplar looks splotchy and uneven if you try to stain it. Not recommended. How are Rejuvenation's Medicine Cabinets built and how do they compare with others? Rejuvenation's traditional Medicine Cabinets are unmatched in quality of materials, craftsmanship, and period-authentic historical accuracy. They're meticulously detailed and handcrafted from real wood - primed, paint-grade poplar with absolutely no MDF or particleboard. All mouldings, trim, and casings are solid wood, the back which recesses into the wall (on inset models) or which rests against the wall (on surface mount models) is solid plywood. With each model, we include a 1-1/4in. beveled mirror, two glass shelves, and fully mortised solid brass ball-tip hinges in your choice of finishes. Optional choices of cabinet knobs, pulls, latches, and catches - also in your choice of finishes - can be ordered separately. Can I install the medicine cabinet myself? We try to be as thorough as possible with our instructions, but the difficulty involved is relative to your experience and comfort with installation projects. Surface-mount cabinets will be easier to install than insert-mount cabinets, which must recess into a hole in your bathroom wall. If your wall is stripped down to the studs, an insert mount is certainly easier than tearing out the wall to retrofit. If you do need to retrofit, or if you just feel overwhelmed by the project, we suggest calling a professional carpenter. Tip: All screws should be hand-tightened. How are inset-mount are surface-mount medicine cabinets different? Most antique medicine cabinets were recessed into the wall, or inset mounted. If your bathroom wall is stripped to the studs, or if you plan to cut a hole in the wall to retrofit the cabinet, choose inset mount. However, understand that retrofitting a new cabinet into an existing wall calls for experienced carpentry skills. Medicine cabinets which are hung directly on a wall are surface mounted. No recessing of the "box" is required. Our Medicine Cabinets are available in a surface-mount option. Surface-mount medicine cabinets have a simple box enclosure, and extend out 5 to 6 inches. Keep this in mind when choosing wall brackets for above or beside one, and read about our deep projection option. What if I've got a corner sink and want to install the cabinet above it, flush to the wall? If you have a traditional corner sink where the sink's sides mount to the wall at 90 degrees, we don't recommend using our Medicine Cabinets, mainly because the projection would likely cause you to bump your head every time you used the sink. A hanging mirror and some nearby shelves would be better, if this is your situation. What are the box dimensions for inset-mount medicine cabinets? Our inset-mount medicine cabinets all have a recessed box size of 18.75in. W x 23.75in. H x 3.75in. D, and rough-in measurements of 19.25in. W x 24.25in. H x 4in. D.
Does Rejuvenation offer other cabinet styles? We won't rule out making other medicine cabinet styles some day, but we've gotten good response from what we currently offer. We're sticking with these styles for now; however, if yours is a design which you feel we must consider, let us know. Which finishes are right for my home? Most antique lighting and hardware, regardless of era, was built in a choice of finishes, as our exclusive products are today. The "right" finish suits your decor and taste, and the product's location. See which finishes apply to lighting, and which apply to hardware, or read on for selection tips. Look at the vintage hardware in your home. Antique door hardware, switch plates and Cover plates give clues to which original finishes or patinas you can match. Polished and Brushed Nickel were used in virtually all kitchens and bathrooms until the mid 1930s when Polished Chrome became popular. Polished Brass was the Victorian era favorite. It suited the fastidiousness of a time when the middle class was defined as "households with 1-2 servants" who polished the brass, among other things. If fastidiousness and servants don't describe your household, know that Lacquered Polished Brass needs no further polishing. 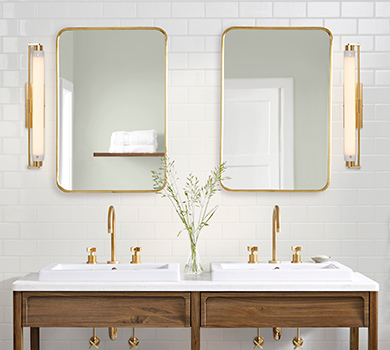 Brushed Brass, the standard of the Craftsman era, Old Brass, Burnished Antique Brass, and Oil-Rubbed Bronze resemble the natural patina unlacquered brass acquires over time, as does Antique Copper for old copper-plated brass lighting. Bronze Gilt, alone or combined with Polished Nickel, was a popular mid-century lighting finish, as seen in our Mid-Century Modern collection. Because of their durability, Nickel, Chrome, and painted finishes like Black Enamel remain traditional outdoor lighting finishes. What's the difference between Polished Nickel and Polished Chrome? There are three main differences: authenticity, color tone, and aging characteristics. Polished Nickel was the standard finish in kitchens and bathrooms from 1900 to 1930, while Polished Chrome was not widely available until the late 1920s. Nickel has a warm, amber tone while chrome has a colder, blue hue. Both finishes are a durable surface plating and age well. Nickel, however, can develop a slightly cloudy tarnish over time, while chrome is generally tarnish-free. How do Push-Button Dimmer Switches work? On our dimmers, the top button acts as an on/off switch, while the lower button rotates to adjust light levels. Note: Dimmer switches are for incandescent fixtures only, and are not for use with fluorescent fixtures or ceiling fans. Also, two dimmer switches cannot fit side-by-side in a two-gang electrical box. Can I use two dimmer switches to control one light? No. Only one dimmer switch should be used in a three-way circuit. How authentic are push-button switches? Push-button wall switches were commonly available by the turn of the century, and the toggle switch followed a little later. Other styles in the early days of electricity included a variety of surface-mounted wall switches on round, wooden, or white porcelain bases. Folks used pull chains, turn-keys, rotary knobs, round levers, and other types of switches - all now unavailable. Push-button switches are as authentic as it gets. Push-button dimmers are not original, though surface-mounted rheostats weren't uncommon. A pair of three-way switches allows one light to be operated from two locations - like the top and bottom of a stairway. They must be installed in pairs, and they require appropriate wiring. A three-way dimmer can substitute for one switch in a three-way pair to allow light-level control. A four-way switch creates a third location. Wiring conditions vary greatly - especially in old houses. Consult a licensed electrician on unusual installations. How do I install a three- or four-way switch? Multiple-location switches require very specific wiring. And, depending on the switch/fixture arrangements, they can send even the brightest minds into dim-witted paralysis. Most basic home-wiring books cover this topic in some detail - and include wiring diagrams for various configurations. Can two dimmer switches fit side-by-side in a single box? In many junction boxes, two dimmer switches will fit side-by-side. But if your boxes are older or unusual, it may be too small to accomodate more than one. A dimmer switch should fit alongside the other push-button switches we sell. Can your switches be used with low-voltage wiring? Our dimmer switches cannot be used with low-voltage wiring. However, the regular push-button switches can be used. Do you offer swatches of your upholstery? Yes! Please visit our swatch request form to have up to 10 samples of our fabric and leather upholstery sent to you. Which light bulbs should I use? Each fixture has a maximum wattage rating (listed in the fixture's Specifications) based on the use of standard incandescent light bulbs (LED and CFL bulbs should generally be lower-wattage and cooler-running than incandescents). Inappropriate bulbs can discolor metal finishes, deteriorate electrical parts, and start fires. We do not guarantee against damage caused by improper light bulbs. Screw-in LED Bulbs can easily be used in most of our fixtures. Note that some of the largest and brightest may have large bases that are tricky to fit in small shades and globes. Our LED bulbs are available in a broad range of sizes, color temperatures, and styles. Screw-in and GU24 CFLs can easily be used in many of our fixtures. GU24 CFLs are highly energy-efficient compact fluorescent bulbs, and can be used in fixtures that are built with a GU24 base. Customers Living in Cold Winter Climates: CFLs take longer to reach full brightness in very cold outdoor temperatures. Our GU24 bulbs have a "start rating" temperature of -20F. Some of our lights look their romantic best with the delightfully dim reproduction Carbon Filament Light Bulbs we sell. Small appliance-type bulbs also provide a soft light without a jarring appearance. However, smaller bulbs burn hotter, so we strongly recommend using less than the listed maximum wattage with appliance-type bulbs. "Decor" bulbs, like those with candle-flame shapes, are made for use in "tips up" position only. Never install pointed bulbs tips down. Tip: Antique fixtures with exposed down-pointed sockets were designed to use with the globe-shaped light bulbs we sell. A light fixture's ability to dim is determined by what bulb you use. While traditional incandescent and halogens are fully dimmable, not all CFLs and LEDs are. Additionally, LED bulbs and fixtures contain drivers that may not be compatible with every dimmer. Verify that the bulb is dimmable, and that your dimmer switch is compatible with it. How are Antique Lights restored? Every antique light we offer is disassembled, cleaned, and re-wired. We strive to use all original parts and components, but if an original part is damaged or missing, a similar period part may be substituted. If a period part is not available we will use a new piece or part (a new socket, for example), that will be called out in the product information. The original finish is restored or preserved in most cases, but if the finish has been damaged or altered, a piece may be refinished. Our refinishing work is done by hand, usually with the same techniques and materials used on the fixture originally. Hand-painting, hand-polishing, hand-finishing - everything is completed by hand in the shop. For the final step, each light is tested to the same standards as a new Rejuvenation light fixture. Are Antique Lights UL Listed? No. Antique lights are restored by Rejuvenation's most experienced craftspeople, who are very familiar with the standards required to meet UL. Each light is restored to make it as close as possible to UL standards while staying within the light's original design. After restoration, each light is tested with the same equipment as Rejuvenation's new UL-listed fixtures, but they are not UL listed. They are also not wet- or damp-rated. Many antique items were painted or repainted with lead-based paint at some point in their use. In cases where lead paint may be present, we are careful to encapsulate the painted area with a layer of lacquered clear coat; this layer seals the paint and prevents it from cracking or chalking. Can Antiques & Vintage items be customized to order? Antiques & Vintage items are sold as-shown and cannot be customized to order. Can I sell my antiques to Rejuvenation? Yes! Read about our buying criteria here and about how to get in touch with an Antiques & Vintage Buyer.